The Kalajian and Dabbakian families have deep roots in New Jersey. Holy Cross Armenian Church in Union City, NJ was the site of both Doug’s parents and my parents marriages in 1942 - just two weeks apart from each other! As children, Doug and I both attended numerous functions at this church with our respective families as did those whose ancestors came from the region of Dikranagerd. When I received a recent email announcing the 2014 Food Festival at Holy Cross Church, I knew I had to post it. Who can come? Anyone in the NY-NJ metropolitan area (even out-of-town visitors!) can attend the annual bazaar and food festival this coming Saturday, November 1st. Admission is FREE! What time? The event begins at 5 PM with a Halloween party for children. Dinner, the main attraction, follows at 6PM. 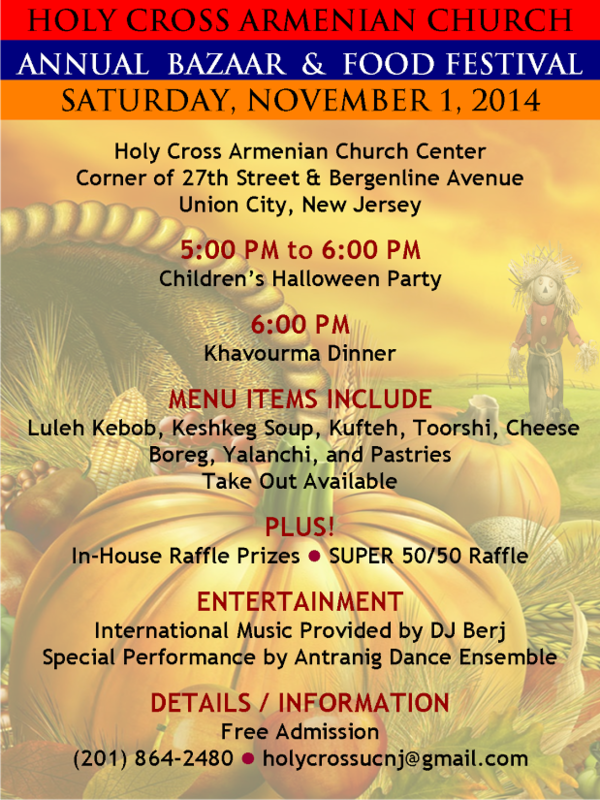 The festivities end around 10 PM, or maybe 11PM - you know, Armenian time!! A word of warning: Don't come too late; allow plenty of time to eat - and - be entertained by DJ Berj.